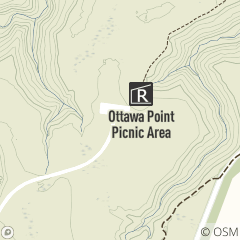 Ottawa Point Picnic Area in summer. Ottawa Point Reserved Picnic Area features a large open shelter with fireplace and is located off Meadows Drive in Brecksville Reservation, between Valley Parkway and Parkview Road in Brecksville. Reservable May through October, daily. For reservations or more information, call 216.635.3304, Monday through Friday, 8:30 a.m. to 4:30 p.m. Explore sections of the Buckeye Trail throughout Cleveland Metroparks.